Why Is God Surprised By Events in The Bible If He Is Omniscient? As I enter more and more into the debate world, there is a peculiar phenomena that I find when debating Christians. It is the belief that eyewitness testimony is at all reliable. Especially so when it comes to the divinity of Yeshua (Jesus). Unfortunately this is completely wrong when it comes to proving the bibles validity. There is no presupposition here. It’s pure fact from study and research. Let’s take a look at the account that Christians give when it comes to the Bibles historic content and what they consider “proof” of Yeshua’s divinity and actions throughout the Bible. Here is a perfect example of faulty testimony taken as truth and a good eyewitness account. Notice how it is first stated that Luke never knew Yeshua and relied solely on “witness” testimony. On this particular website (I have given the citation beneath each paragraph), is very common to the Christian way of thinking. The problem here is that we have proven, especially in our Criminal Justice system, that first account eyewitness testimony is unreliable. Yet Bible scholars will have you believe that not only is the supposedly eyewitness accounts 100% accurate but that second, third, and fourth person accounts are reliable as well. I don’t think so. The following except is from Stanford University’s Journal of Legal Studies. What does this say about eyewitness accounts? The proof is in the pudding. They are unreliable. The human mind interprets things using several factors. Prior experience, sequence and pattern recognition and understanding of a situation to process information. 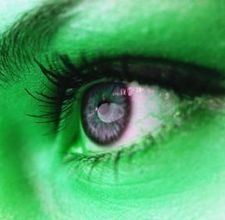 It has been proven many times that your eyes can “play tricks” on you. How does all this fit into the account of Yeshua, his divinity and even his existence? THERE IS NO VALID PROOF OF ANY OF IT. If we know that eyewitness testimony can and is without a doubt faulty. If we know that there are no complete records (if any) of who indeed wrote the New Testament. I believe we can come to the simple conclusion that the possibility of the bibles accuracy is definitely in question. I personally would go even further is stating that is most likely a document made up of false memories, embellishments and exaggerations. Yet many still choose to cling to a book that by itself can not stand up to scrutiny. Still even more claim that this book is, without a doubt, the official word of god and should be treated as such. All this after knowing of changes that have been made. Books removed for lack of conical material and now a debunking of the eyewitness accounts in the Bible. I didn’t start out as an atheist. Like many Hispanics here in America, I was indoctrinated at an early age. I remember quoting scripture at the age of 7-8 on the public train in New York City. I was kind of like a monkey doing palor tricks for the delight of strangers that shared the metal wheeled rocket. Life was simple. My idea at a young age of what it was to be an american was simple. As I got older of course things became a little more complicated. Hormones, social diversity and racism became the norm. My view of America was still very limited. Naively I believed that my little world should be the only thing that mattered to me. If there was not immediate need for anything then nothing was done. Now that I am in my 30’s I am faced with a bigger America. An America where people kill, hurt and slander, not only because of skin color but because of religious beliefs. I mean, we heard about it as a kid, but in the great melting pot of NY, living in predominately Hispanic neighborhoods, who ever see’s a Jew or Muslim get hurt? As a Atheist, I know the reality of all this now and see it almost every day. This is the subject that I want to address. Many (christian) people today claim that this country is founded on christian principles. That is something for someone else to argue (at this point in time). But many atheist feel that in this country, if you are not a Christian, you are not an American, not a patriot. I have served this country for six years as part of her Naval force and loved every minute of it. Does American patriotism equal christian beliefs? Is what makes this a great country the fact that we believe in a monothesic god? I hope not. I think that this country is fostered first and foremost on a sense of brotherhood. The cry “WE ARE AMERICANS!” stands out more than “WE ARE A CHRISTIAN NATION!”. There is incident that comes to mind when I think about what America truly stands for. When I was about 16 or 17 I lived in upstate New York, which at that time was predominately white. There was one particular young man named Eric Rendi who was just a little more racist than some of the others that I had encountered. It was so bad that every time we saw one another there would either be a fist fight or people on both sides restraining the both of us. After about a year Eric signed up to the Marines and left for bootcamp. In as small of a town that we lived in, it was a relief to not have that added stress to my life. One day, several months later, I was sitting in a play ground just hanging out and enjoying they day when I heard someone approaching my area. I looked up and there was Eric walking casually in my direction, eyes locked on me. Now you have to understand that every time Eric and I met up it was instant confrontation, instant violence. I stood, curled my fists and prepared for a fight. Eric walked calmly up to me and shook his head. “I didn’t come here for that.” He stated to me quietly. Before I could say another word Eric offered his open hand to me and said to me, ” I have been really unfair to you and I apologize. My time in the Marines has shown me that it doesn’t matter if someone is black, white, yellow or red. All that matters is that that someone has your back when you need them there. When your life is on the line.” In my flabbergasted silence I shook Eric’s hand. What else could I do? He nodded at me again and finished off with, “I don’t know if we can ever be friends but I have no problem with you and you will get no problems from me. Be safe.” With that being said, Eric turned walked away. I had seen Eric a few times before he left again for where ever the Corp has sent him. And each time he acknowledge my presence with a slight nod and nothing more. I wasn’t offended at all. I was in awe and in a lot of ways, that day, Eric became a hero to me or rather the embodiement of what a hero does. At some point he realized that nothing else mattters. Race, religion or creed is all irrelevant. In a silent word he screamed “WE ARE AMERICANS!” and it meant more than any other label or belief out there. It was stronger than his upbringing or beliefs about different people. Eric learned a lesson that was so fundamental that he felt compelled to honor that lesson and let it take him where many may want to go and do, but few have the fortitude to hold true to. This is the point of this blog. You will see me argue points on religion and other things. Realize though it’s with an understanding that we are all Americans. At the end of the day does it matter if you are a theist or an atheist? Does it matter if on the dollar bill it say in God WE TRUST or maybe a better saying would be ONE NATION INDIVISIBLE. We are one great nation people! A nation that people far and wide come to so that they can escape persecution. We were a nation that everyone believed we held fair play close to our hearts and that the underdog does not have to be the underdog. We need to find a common ground that expresses the melting pot that America is and cry with our hearts to the rest of the world that WE ARE AMERICA! And we will not be swayed by the petty differences that divide the rest of the world. We should be leaders in science, ethics and set the social standards in which the world models itself. 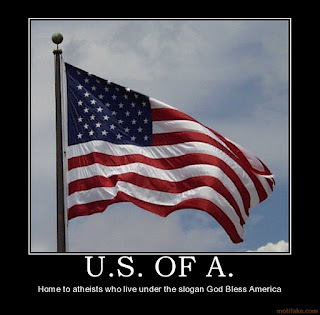 If your a theist; God bless America? This is your belief and of course, in your faith, he does! Why else would you still be here? As an Atheist I know that there are many a great people here in this country. I call them brothers whether theist or atheist because they are my patriotic brothers. Just like Eric Rendi. It took me years of learning and military service to understand how speacial you really are. I never thanked you, but I do now. I hope life has lived up to your expectations and wish you nothing but the best. “And God saw that the wickedness of man was great in the earth, and that every imagination of the thoughts of his heart was only evil continually. These are two interesting lines here. Why would an omniscient being actually be surprised and depressed about a situation that he knew was going to come to pass? People, forget about the initial creation of man. From the moment the christian god chose to create man kind, he knew our past, present and future. In actuality, these concepts of linear time would not have meant anything to the christian god. He would know just know everything about us. So god knew that the Nephlim were coming to earth. God knew that man would become wicked (because of original sin that was brought about by a situation that he created himself. But that is another thing altogether.) Why would he feel sorry and regret making us. If god is indeed capable of feeling regret, wouldn’t he have felt that from the simple knowledge of humanities existence. Then why create us? It seem that the biblical god is actually surprised that man is so wicked. Now notice here that regret is used in the context of a person feeling regret for their actions or inaction’s. The consequences that follow and the things that one cannot control at times, i.e. losses and limitations. Which one of these categories does the christian god fall into? So recently I ran into a blog by Knight’s Christian. I will point out something wrong about you. You sir, are intellectually honest. You throw about big words like logical fallicies and then go and commit the same fallicies. Lol. Let’s use one of your little snippets to show what an insidious cur you really are. Since you like ad homiens, this should be right up your ally. You stated, “My obvious point was: FIRST OR SECOND OR THIRD do not determine what is true,”. You have a point here. So let’s start at the beginning. What makes Xianity correct or true? Whether is wast “first, second or third”? Let’s start there moron. Also, when you respond, please use certain grammatical tools; sentence structure, punctuation and proper grammer. Thank youHere is a copy of our emails. shut up pest. ignored for being an arrogant moron, and a really dumb one. how am i a moron from what my about me on facebook and journal say? what an oblivious demonic idiot. u r completely ignored, just like uve done with my clearly good accomplishments. Boooooo. Barely looked at my journal then starts arrogantly mocking, boooooooo, called me a moron without any justification, didn’t even check my bios, booooooo, didn’t show any appreciation for the links all over my journal linking to articles ive written that are clearly factual and meaningful beyond most of the babble spouted in life, boooooooo. May God save you before u end up in Hell, fault-finder thankless horse with blinders on tunnel vision Nelson. “Obviously you could not answer me here. Is it because you are afraid of what people might think. Let’s discuss your emails to me.” was all I read. The Bible says to avoid arguments of ignorance, as someone who knows logical fallacies well and wrote a book on them and corrected the mistakes of others, there’s no way you could match me, especially as someone who denies Truth, God. If you can’t stand to read a Christian site on logical fallacies, try an atheist one like nikzor. Goodbye stubborn math student. There is a reason why I did not have to review your bio etc. My comment was directed towards the blog that I commented on. Now, if you wan’t me to view the rest of your “good” work and refute and rebutt, I can do that. Funny thing is you did not even have the honesty to post my comment. I have the blinders on, yet all it seems like you did on the blog I commented on was use personal attacks. That is why you are intellectually dishonest and called a moron. Funny how theist whine and complain when the roles are switched. Oh and I will be posting these emails on my blogs and your original blog so that others can judge for themselves. You make assertions without any thing to back them up. All you do is “beg the question” and use other logical fallicies. I am to respect that? Lol, no. You lost me at ICR. How many times has the trash thet they spewed been debunked and shown as nothing more than wishful creationist nonsense. What I find even funnier is that you did not have the fortitude to post your response to me via your blog. Only via email. Feeling like someone who understands the topic might have you beat at your own game? What do you think? Would love to hear anyone’s thoughts on the subject. Or will you make a change to save your life?